On September 22, 2013, Germany will hold general elections. These elections will be observed with special attention given what it will mean for the austerity policies of the Merkel government and the ‘Euro crisis.’ From an anti-austerity and socialist perspective, the elections are also important with regard to the situation for the new German Left Party Die LINKE . Despite growing economic and social inequality, the Left Party stands at just 8 per cent in opinion polls. The party faces the challenge of presenting itself as a genuine alternative in an unfavourable and even hostile political environment in Germany. In this article, published exclusively in the left-wing daily newspaper Junge Welt , Oskar Lafontaine reflects on the current conjuncture for the party. Lafontaine started his career as Willy Brandt‘s most politically talented ‘son’; became the most popular leader of West Germany’s Social Democratic Party (SPD) during its years in opposition between 1982 and 1998; was deemed “the most dangerous man in Europe” by the British press for his financial market regulation plans as the Finance Minister of the first coalition government of SPD and Greens in 1998, but stepped down when he realized the lack of support for his left-Keynesian policies within the coalition. In the early 2000s Lafontaine was a prominent critic of the new government’s neoliberal course and in 2004 he joined the new West German party Election Alternative for Work and Social Justice (WASG) formed by trade unionists, left-wing economists, SPD dissidents and radical leftists, on the condition that it would merge with the East German Party of Democratic Socialism (PDS) to form a united German Left Party. 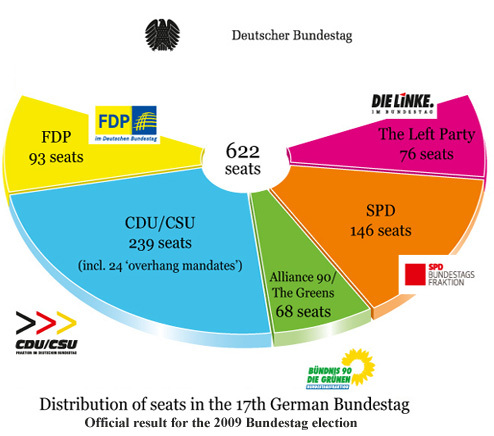 In the 2005 national elections Lafontaine led the new party formation into the Bundestag with 8.7 per cent and in 2009 with 11.9 per cent of the popular vote. For health reasons Lafontaine stepped down from his leadership positions nationally and decided to concentrate on the role of opposition leader in his home state of Saarland. His voice nevertheless remains influential within the Left Party and calls for his return to the national stage are frequent. In the coming months a comedy will be staged in Germany. The piece is called ‘Electoral Battle of the Political Camps.’ The leading actors are Angela Merkel and Peer Steinbrück. In supporting roles we’ll see Horst Seehofer, Sigmar Gabriel, Philipp Rösler, Jürgen Trittin and the other respective leaders of the Christian Democratic Union/Christian Social Union (CDU/CSU), the Social Democratic Party (SPD), the Free Democratic Party (FDP) and the Green Party. An appearance by Die Linke is not envisaged for this revue. With the help of the intelligence service, the corporate media and public broadcasters, everything possible is being done to banish this inconvenient party from the catwalks of capitalism. Years ago the sharp-tongued American author Gore Vidal observed, “Democracy is a place where numerous elections are held at great cost without issues and with interchangeable candidates.” For Vidal, the USA does not have two, but only one political party, “with two right wings,” which campaigns for the interests of major corporations. He considered the media to be instruments of propaganda for the preservation of social power relations. The Americanization of German politics has undoubtedly led to the fact that today, even in Germany, we have a one-party system with four wings – to stay with Gore Vidal’s image. The wings call themselves the CDU/CSU, SPD, FDP or the Greens, and they campaign, sometimes more, sometimes less, in the interests of banks and major corporations – as the tax policies of recent years and the many bank rescue packages demonstrate. They endorse without any reservations an economic system which results in an unequal distribution of prosperity, wealth and power; a system that allows a minority to have the majority work for it and then withhold from this majority the fully entitled proceeds of their labour, in the form of wages and employee shares. In contrast to the German Unity Party, Die Linke believes property should only be the result of one’s effort; it should result from one’s own labour and not from the fact that someone has appropriated the labour of others. So long as great fortunes and the accompanying social power structures are created in such a way that a minority “exploits” the labour of the majority, the interests of the majority cannot logically prevail. In other words, a democracy; that is to say, a social order in which the interests of the majority are asserted, flounders upon the power structure reinforced by the German Unity Party. So long as this remains unaffected phony struggles will be waged and fierce conflicts can be conducted on peripheral battlefields. The less that fundamental political positions differ from one another, the louder the shouting must be to maintain the appearance of a contest between the political camps. 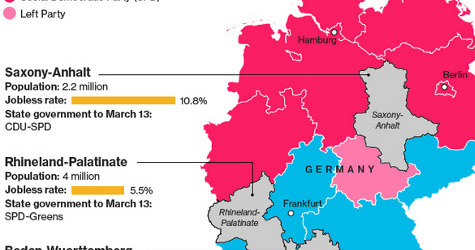 As Heribert Prantl once more points out, “There probably are, despite the fuss that is made about retirement policies, only one thousand people in Germany, who could spell out the difference between the CDU/CSU and the SPD. It’s the same with other issues.” Even the Frankfurter Allgemeine Zeitung talks about a “phoney” campaign between the political camps. Nor should we let ourselves be blinded by the SPD-Green “plagiarism scandal.” With great effort the Social Democrats and the Greens have copied and modified policy proposals from Die Linke in order to make us forget the social dislocations caused by their coalition policies – precarious working conditions, low wages, seniors living in poverty, and the destruction of the social security system. This applies also to other policies: a minimum wage, modest improvements to pensions, an increase in Hartz IV benefits, medical fees, tuition fees, temporary work, work contracts, top tax rates, a wealth tax, a withholding tax, a financial transaction tax, rent control, energy price limits, a cap on interest rates for consumer credit, Eurobonds, the revocation of bank licenses, the abetting of tax evasion, separation of commercial and investment banking, limits to execute salaries, creditor liability, and debt haircuts, to name but a few examples. This theft of ideas cannot hide the fact that when it matters the SPD and Greens, as well as the CDU/CSU and FDP, show themselves to be loyal fractions of the German Unity Party. The unanimous approval for the balanced budget amendment to the constitution, for the European fiscal compact, and for the various rescue packages, shows that the “left camp,” consisting of the SPD and Greens, have not detached themselves from their Hartz IV and Agenda 2010 policies. The fiscal compact represents the consolidation of these brutal austerity policies for all of Europe. The only reason the SPD and Greens have the chutzpah to call themselves European parties is because they have internalized a Europe of free markets and corporations as the only possibility. If we measure social reality according to declared political objectives, it is then not too harsh a judgement to describe both ‘left-wing’ protagonists of the forthcoming ‘battle of the political camps’ as European flops. With the participation of the then SPD-Green chancellor Gerhard Schröder, the European Council resolved in Lisbon in December 2000 to make the EU, “the most competitive and dynamic knowledge-based economy in the world, capable of sustainable economic growth with more and better jobs and greater social cohesion.” That was the noble goal. But what does the reality look it? When young Europeans – who are becoming unemployed en masse – read this today, they are fully justified in being dubious about the powers of judgment of these state leaders. When will the politicians of the German Unity Party grasp that an economic system, which has profit and wealth maximization for a minority as its goal, inevitably produces conditions such as we now observe in Europe? Because it’s inherent to the system, it is also logical that both ‘camps’ have chosen so-called wars for human rights as the central instruments of their foreign policies. In inimitable fashion Prince Harry captured the quintessence of the new era of German foreign policy on the front page of the Bild newspaper with his comment, “Take a life to save a life. That’s what we revolve around, I suppose.” It is telling in this regard that politicians from the SPD and Greens strongly criticized Merkel and Westerwelle for not letting Germany participate in NATO’s war on Libya. 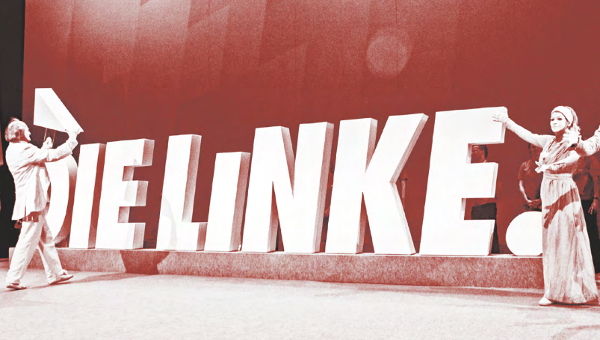 Die Linke – and this is understood by the vast majority of its followers and members – has a right to exist, and can be successful in the elections only if it does not become another wing of the German Unity Party. 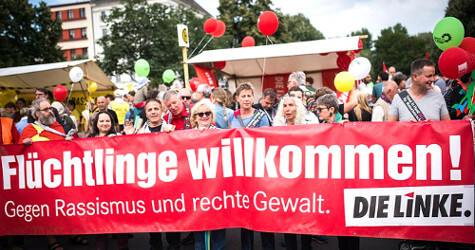 Die Linke’s unique characteristic is its advocacy of an economic system, in which everyone receives the full proceeds of their labour. Such an economic system leads to democratic enterprises run by workers and not authoritarian economic structures with temporary work, contract work, low wages and mini-jobs. It leads to a peaceful foreign policy, which secures raw materials through negotiations and not with wars for human rights. With this in mind it is clear why the SPD and the Greens have for years now rebuffed offers of cooperation by Die Linke. The politicians of the German Unity Party stick together. They reject structural reforms that would alter the ever-increasing unequal distribution of affluence and opportunities in Germany. 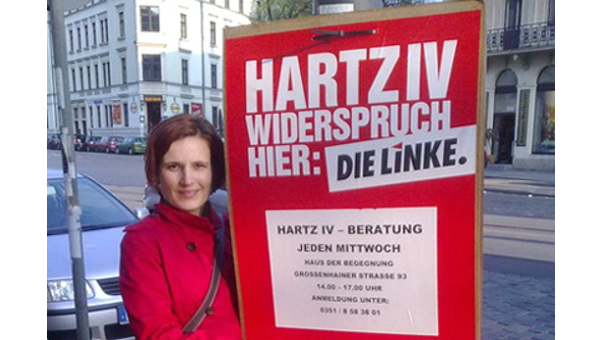 The electoral programs of the SPD and Greens, in which the proposals of Die Linke have been adopted in whole or in watered-down form, serve only as a disguise. Voters are not to know that behind the proclamations no actual intent for their realization exists. Yet as Franz Müntefering, the onetime great master of social democratic campaigns said: It’s unfair to judge political parties after the election according to their campaign promises. This article originally appeared in Junge Welt on March 21, 2013. Translation by Sam Putinja. Oskar Lafontaine was the co-chairman of Die Linke (2007-2010).